From Belgium, comes a vicious shapeshifter with more forms than a Trasnformer, the Kludde. The Kludde's method of attack is usually chasing after humans and the faster a human runs ,the faster the Kludde pursues them. An earlyu warning of the Kludde are the sounds of the chains that it is usually bound to, or the glowing blue flames of its eyes. The Kludde's actions range from either simply confusing travelers by giving wild rides or transforming into false landmarks, to killing humans via increasing its weight to just tearing their throats out. The Kludde can also be simply content with terrifying a traveler and just disappear. The Kludde is warded off only by daybreak and church bells, as it hurts them. 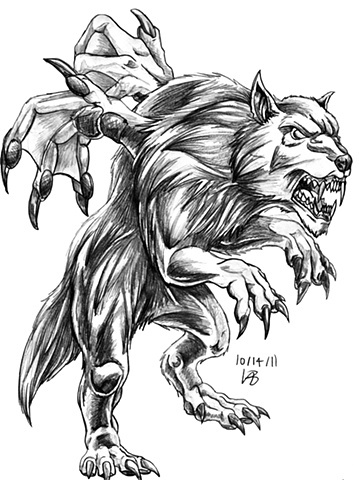 In my version of the Kludde, I use the walking dog form with wings, as that is the form its described as being the most malacious and violent form. The pose is rendered from artwork of the Kludde, while I beefed up the vicious wolf. The wings, I drew as being like larger paws with skin flaps as making them more decorative than practical.since it teleports and runs incredibly fast, flight doesn't seem to be a necessity with instantaneous long- range travel, so I figure they are more psychological as it flaps them to further terrify their victims.